Fr. Chris was born June 29, 1963 in Washington, DC to Louis and Muriel Tozzi. He has 2 brothers and 1 sister all of whom are married and reside with their families outside San Diego. Fr. Chris grew up in Kensington, Maryland, a suburb of Washington, where he and his siblings completed their primary and secondary education. Fr. Chris attended the University of Maryland, College Park where he received a B.A. in Economics in 1987. He earned a commission in the U.S. Naval Reserve through the George Washington University NROTC program In December of 1987. After training in Pensacola, FL and Athens, GA and service in Chinhae, Korea Fr. Chris, then LT Chris Tozzi, arrived in San Diego on December 31, 1991 to serve as the Assistant Supply Officer on USS Cleveland (LPD-7). Fr. Chris was honorably discharged from the U.S. Naval Reserve in February of 1993. After the Navy, Fr. Chris worked as a restaurant manager, behavioral counselor for developmentally disabled adults, a technical support engineer and a software tester, and a realtor in San Diego, and a background actor (an extra) in Los Angeles, CA. From 1992 to 2005 he attended Saint Brigid Parish in Pacific Beach where he led several parish music groups, served as a member of the RCIA Team, on the liturgy committee, as a Eucharistic Minister and participated in the parish Young Adult Ministries. He entered Saint Francis Center for Priestly Formation on the Campus of the University of San Diego in August of 2005. He later attended Saint John’s Seminary in Camarillo, CA from which he obtained a Master of Arts in Pastoral Ministry degree. Fr. Chris was ordained June 10, 2010, and served as an associate pastor at Saint Brigid Parish until October of 2012. He was named pastor of Saint Charles Borromeo Parish by Bishop Robert H. Brom October 17, 2012 and assumed the pastorate of Saint Charles Borromeo on November 5, 2012. Some of Fr. Chris’s non-spiritually related interests include physical training, the Padres, computers, digital art and music. Saint Charles Borromeo Parish & Academy’s New Pastor! Fr. 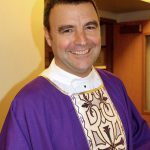 John Amsberry is currently the pastor of St. Joseph the Worker in Portland, Oregon. Ordained in 1997, Fr. John has spread the Good News of Jesus the United States, Canada and beyond for over 20 years. He served for 2 years on the National Evangelization Teams reaching out to youth with the Good News of Jesus Christ. A favorite around the country, Fr. John is passionate about the love of God revealed in Christ through the power of The Holy Spirit and the teachings of Pope Francis. Dynamic, faithful to the church and on fire, Fr. John has a heart for evangelization. He will assume his duties at Saint Charles Borromeo on July 1, 2017.